Apart from its ghat and allies, Varanasi is famous for the vibrant variety of street food and drinks. No matter where you are in the city you will always be accompanied by the street food shops. It’s always good to be surrounded by food but when you have so many options decisionmaking gets tough. To help you out in shortlisting the best options we have compelled a list of top 10 best places to eat street food in Varanasi. Deena Chaat Bhandaar is famous for its Tamatar chat and Chuda Matar. Tamatar chat which is an original Banarasi street food has a unique taste and is served in earthen cups. While on the other hand, Chuda Matar is very famous north Indian food. There are 2 Deena chaat shops in Varanasi and the original one is located right behind the Chowk thana. This shop is more than 200 years old! Shri Madhur Jal Paan is located in Sarafa Gali near Gowdalia chowk. Madhur Jal Paan is quite famous among locals for their quality food. We’d recommend having Samosas and Gulabjamun from here. They have their own special red chutney which is not available anywhere. Please beware of the fake shops which have been opened in the same street. The real one looks very modest and is on the left side of the lane. Malaiyo is a winter exclusive sweet of Varanasi. If you haven’t heard about it before then checkout Malaiyo – The Winter Delicacy of Varanasi. These days you can find Malaiyo everywhere in Varanasi, in fact, you can even find a closer version of it in Lucknow and Delhi. But if you wish to have the original one then visit Markandey near Gopal Mandir they have been selling it for last 100 years! This shop serves Cutlets and Panner Bread Pakora. Just in case you don’t know, Bread Pakora is a popular Indian fried snack and a very common street food. This shop has developed a unique version of it by fusing their delicious Banarasi chutneys and masala. Despite being a new shop it has gained much popularity, especially in Chowk area.The sweet, sour, crispy and salty taste sometimes described as a blast of flavours is worth trying! Blue Lassi shop is just 5 minutes away from the Manikarnika Ghat and 3 minutes away from Neelu Kachori Bhandar. You can easily spot it by its vibrant blue colour which also gives it its name. Blue lassi shop is more than 75 years and three generations old. The present owner Chanchal has mastered the art of developing unique flavoured lassi, which is pretty much why it is famous for. Everyone in India knows about malai but not everyone loves it. Those who like it enjoy it every day at least that’s how it is in Varanasi. This shop is located right next to the Bhramnal market and is 80 years old. Their process of making Malai is same as it was 80 years ago and that’s what gives their products an authentic taste. Made from the buffalo milk Malai has 55% butterfat. They serve malai and its products in earthen pots which also enhance the taste of it. Our favourite is malai puri It is made from malai but the core of it is filled with delicious Rabdi! Everest Cafe and Momos corner is located on the Shivala Ghat. The place is famous for its veg momos, Omellete, and freshly cooked food. To reach the cafe you will have to climb up a long stair which will lead you to the amazing views of ghats and Ganges. Sit back, relax and enjoy yummy momos with the amazing view. Located near BHU, Lanka Chachi ki Dukan is famous for their Jalebi and Kachori Sabji. Just like all the old shops in Varanasi, it has no signboard but still, everyone knows about it. 50 years old Laxmi chai shop is one of the most famous Chai shops in India. Located near chowk thana area it serves tea until late night. 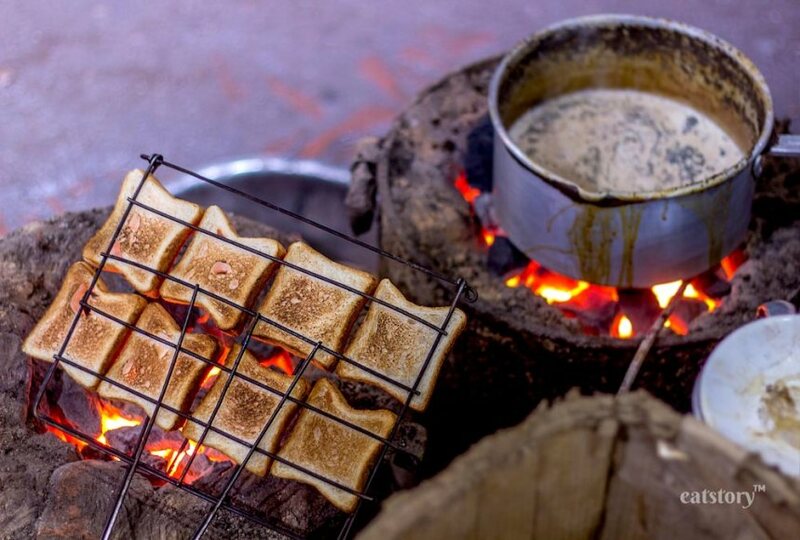 They also serve toasted bread lathered up with yummy butter and malai which goes really well with a hot cup of tea. Every tea shop in India is a place to talk about politics, Cricket and life. If you have a glimpse of it then head over to this shop. Which is your favourite shop to hog food in Varanasi? Would you like any other shop in the list? Please let us know in comments, We would love to give it a try!